ME Conferences welcomes you at 15th International Conference on Nephrology and Hypertension from January 30-31, 2019 Abu Dhabi, UAE. 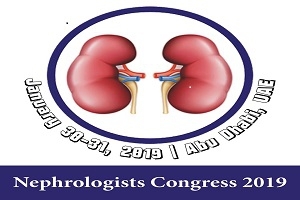 Nephrology Conferences regards each one of the individuals to go to the 'Nephrologists Congress 2019' amidst January 30-31, 2019 at Abu Dhabi, UAE which melds brief keynote presentations, speaker talks, Exhibition, Symposia, and Workshops. Nephrologists Congress 2019 has been designed to extensively explore a variety of scientific and clinical aspects of hypertension & Kidney disease throughout the lifespan, and throughout the spectrum of kidney disease. Nephrologists Congress 2019 will be an international event focusing on the core knowledge and major advances in the ever-expanding field of Nephrology & Hypertension by attracting experts on a global scale. This year, we also hope to bring together experiences from different countries and exchange their views, reinforce knowledge base, and learn new concepts. With the participation of outstanding international experts, we hope productive discussions would stimulate new creative ideas to translate new discoveries into better diagnosis and treatment of Renal Diseases. We sincerely invite you to join us in this very informative annual conference and collaborate in the global action in reducing the burden of Hypertension & Renal Diseases. Your presence will certainly add value to the conference and very much appreciated!